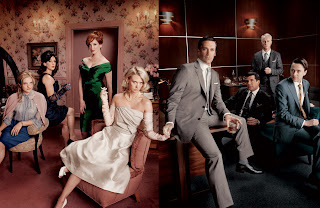 Tonight Mad Men starts the final series and to enhance your experience, The Unofficial Mad Men Cookbook is holding a blogtail party with bloggers all over the universe posting recipes, reviews, and more. The Unofficial Mad Men Cookbook by Judy Gelman and Peter Zheutlin is a great addition to my Theme Cookbook Shelf! There are definitely chocolate recipes, but there are also great cocktail (no surprise there), appetizer, main dish, and dessert recipes that are mentioned in the show. Want to win a copy of The Unofficial Mad Men Cookbook? 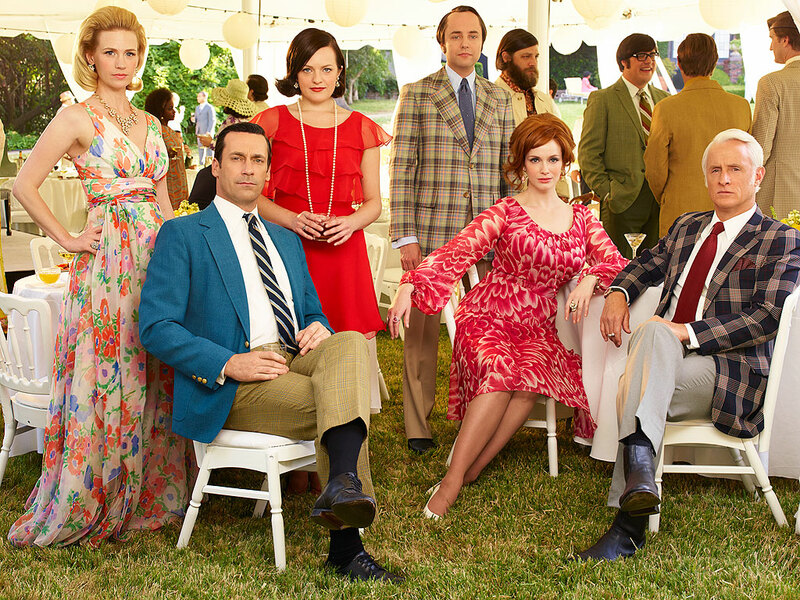 Post a comment about your favorite "Mad Men" retro recipe! Want to join the party? Go here for Food, cocktails and lifestyle bloggers worldwide. Over the many seasons of the show, I've posted 'retro' recipes that Betty or any number of the 'women' on the show might have made. Here are two of my favorite chocolate cakes from the 60s. The first recipe is for a Coca Cola Chocolate Cake. 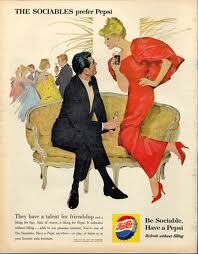 If you'll remember, Betty was a former model, and she returned to her 'career' to shoot a Coca Cola ad (see below). There are many versions of this Coca Cola Chocolate Cake, and if you're a Pepsi fan, you can always substitute Pepsi in the recipe. See the Retro Pepsi Ad below. Is that Don Draper in the Ad? Was it his account? The second recipe is for 7-Up Chocolate Cake that's made from a mix. Mixes were new and 'time-saving' in the 50s and 60s. You'll love the instructions. They're pretty retro, too. I couldn't resist, though, posting three different icing recipes (and techniques). Take your pick. So, get out your 'Pyrex' dish and bake a Retro Chocolate Cake! Sift together flour and sugar. Heat to boiling point the butter, cocoa and Coca-Cola. Add to flour and sugar mixture. Stir to blend. Add buttermilk, soda, eggs, salt and vanilla. Stir with spoon until well blended. Pour into greased and floured oblong pan (Pyrex dish). Bake at 350 degrees for 30-35 minutes. Batter will be thin. Ice while hot. Heat to boiling point--butter, cocoa and Cola-Cola. Add confectioners' sugar and vanilla; stir to blend. Using a fork, make holes in hot cake and pour hot icing over it. Cream Butter, sugar, and peanut butter. Add milk and stir well. Add nuts. Spread over warm cake. Place iced cake under broiler about 4-inches from heat source. Broil just a few seconds, or until topping starts to bubble. DO NOT scorch! Let cool at least 30 minutes before serving. Chocolate 7-Up Cake is also perfect for tonight's party! This Chocolate 7-Up Cake recipe uses Duncan Hines Devil's Food Cake Mix and 7-Up, and the Dobash Frosting uses Ghirardelli cocoa, one of my favorites. 7-Up Cakes are light and airy. Combine above and beat for 4 minutes with electric mixer. Combine all in saucepan and bring to a boil. Add 1/2 cup water to make a paste. Stir into cocoa mixture with whisk over heat until it thickens. Pour while hot over cake and spread. Are you a Dr. Pepper Fan? Read this post on Dr. Pepper and a Dr. Pepper Chocolate Cake. CHOCOLATE COVERED RAISIN BUNDT CAKE!